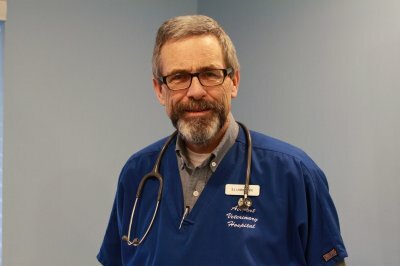 Dr. Steven J. Lindner graduated from Michigan State University’s College of Veterinary Medicine in 1979 and began working at Airport Veterinary Hospital in June of the same year. A Michigan native, Dr. Lindner grew up in Ypsilanti in a household that was never without a pet cat. While he was in college, he became acquainted with a veterinarian who worked with horses belonging to one of his friends, and he began to spend a lot of his time “hanging around” a local veterinary hospital. Thus, it was only natural for Dr. Lindner to pursue his interests in veterinary medicine. Outside of Airport Veterinary Hospital, Dr. Lindner enjoys spending time with his wife and children. He also is a proud owner of two Labrador Retrievers (Mandy and Lily).